The Grenhornes are an amazing retro 1960's garage rock band. These guys stand out well above the legion of garage rock revivalist acts out there. 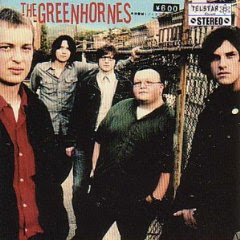 Their first album, simply titled "The Greenhornes"(2001), is a masterpiece. Their outlook is gloomy, and their sound brings to mind the best of the The Yardbirds, The Kinks, The Standells, early Paul Revere and the Raiders and the like...a perfect mixture of blues, soul, and a fuzzed out yet highly polished and melodic sound. The vocals and harmonies are incredible, engaging, yet detached. They fuse all of the best things about the garage rock era into something completely original and all their own, making it sound fresh and new again. If you're into 1960's garage rock like I am and you enjoy the "Nuggets" and "Pebbles" compilations as much as I do, this is a must have in your collection. And even if you're not, give these guys a listen anyway. I'm sure you will like them. Here's "Let Me Be", and "Can't Stand It". Enjoy. Steve... in a "Six Degrees of Kevin Bacon" move one of my buddies in New Orleans went to school/worked with Little Jack's fiance. They are still tight and she and Jack stay with him when they come through town. When The Raconteurs played jazzfest Jack and his chick hung out for two or three days and caught up with the band at the next show. I've never met him. Just think it was interesting enough to mention. Small world. Interesting. A small world indeed.